The T.DIST Function is categorized under Statistical functionsFunctionsList of the most important Excel functions for financial analysts. This cheat sheet covers 100s of functions that are critical to know as an Excel analyst. It will calculate the student’s T distribution. The student’s t-distribution is a continuous probability distribution that is frequently used in testing hypotheses on small sample data sets. 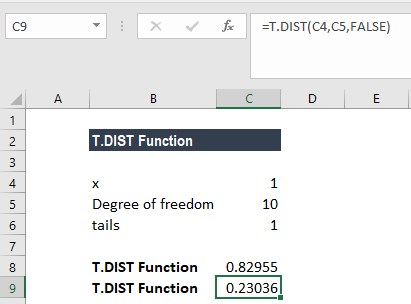 This guide will show you how to use the T Distribution Excel formula and T Value Excel function step by step. As a financial analystFinancial Analyst Job DescriptionSee a real Financial Analyst Job Description including all the skills, experience, and education required to be the successful candidate for the job. Perform financial forecasting, reporting, and operational metrics tracking, analyze financial data, create financial models, T.DIST is used in portfolio risk analysis. It is used to model asset returns to take care of heavy tails. It is so as the T distribution includes fatter tails, which gives higher values of value-at-risk at high confidence levels. 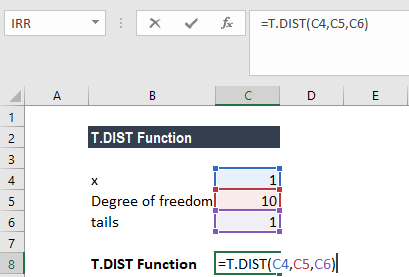 The T.DIST function was introduced in Excel 2010, hence is not available in earlier versions. X (required argument) – It is the numeric value at which we wish to evaluate the Student’s T Distribution. 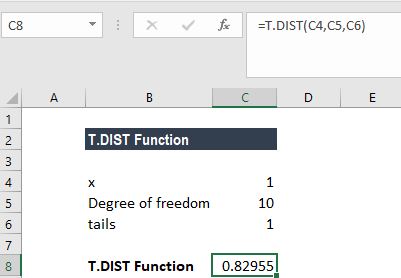 Deg_freedom (required argument) – It is an integer that indicates the number of degrees of freedom. Tails (required argument) – It specifies the number of distribution tails that would be returned. If tails =1, T.DIST returns the one-tailed distribution. If tails = 2, T.DIST returns the two-tailed distribution. The result we get is 82.95%. The result we get is 23.036%. The given cumulative is TRUE and deg_freedom < 1. The given cumulative is FALSE and deg_freedom < 0. VALUE! error – Occurs when the given arguments are non-numeric. 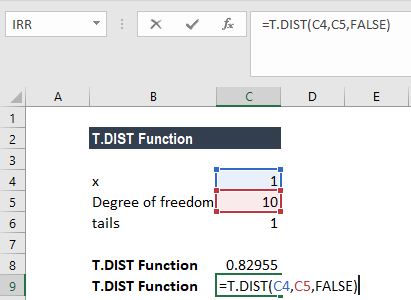 The deg_freedom and tails arguments are truncated to integers. #DIV/0 error – Occurs when the given cumulative is FALSE and deg_freedom is equal to 0.